Neha Lorenzo joined HHHunt in 2018 as Community Manager at Abberly Avera Apartments. Neha is a graduate of Florida Atlantic University. She began her career in the apartment living industry in 2010 in Miami, Florida and most recently served as Community Manager in the D.C. Metropolitan area. Neha holds various industry related certifications including a Certified Apartment Manager designation through the National Apartment Association. In her role as Community Manager, she manages and leads a team of leasing, customer service, and maintenance professionals, delivering on our Brand Promises every day. What drives Neha is ensuring that each resident at Abberly Avera receives a consistent experience and high level of satisfaction with our product and our team, and interactions with our team reflect the Values of HHHunt. In her spare time, Neha enjoys skydiving, hiking, traveling, watching bad scary movies, building small projects in her home and spending quality time with family and friends. 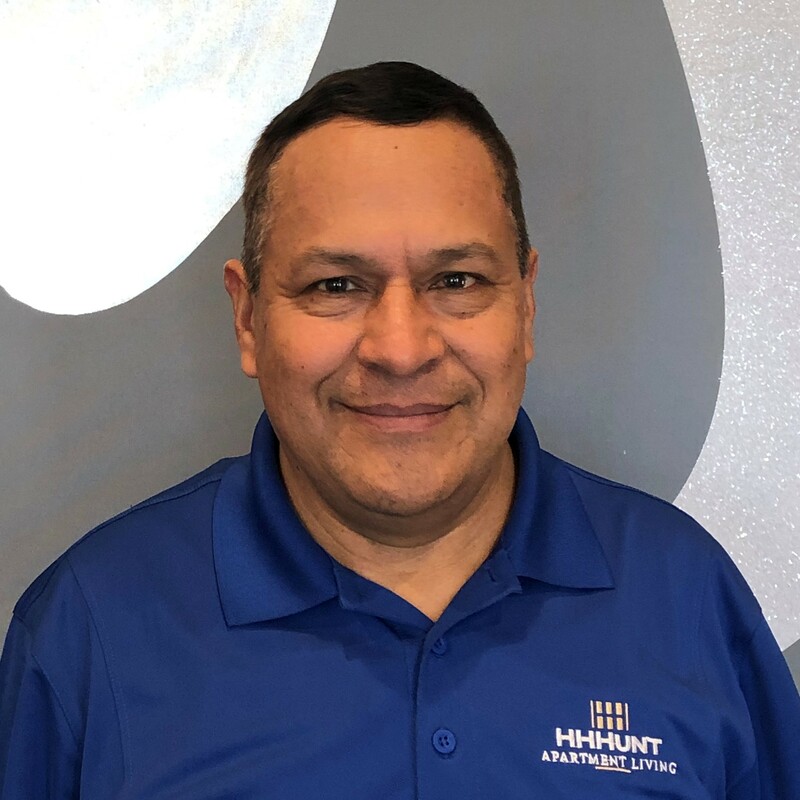 Carlos joined HHHunt in 2019 as the Service Manager at Abberly Avera. Carlos brings over 10 years of experience as a service technician and service manager and will greatly impact the customer experience at Abberly Avera. He has several years of experience with companies that are located in high demand areas. Carlos has HVAC certifications, Team Management, and Safety on Site certifications. Carlos is fluent in Spanish and English, and he is originally from Peru. He moved to the United States in 2006. He is very proud of his role in the community and looks forward to providing excellent customer service. When he's not working, Carlos enjoys reading and listening to music. Sara Demes began her career in the apartment industry when she joined HHHunt in 2013 as a Leasing Consultant at Foxridge in Blacksburg, VA. Sara moved to Canada with her husband while he pursued his PhD, and she continued to work in the apartment industry, gaining more experience in leasing, accounting, and administrative roles. She rejoined HHHunt in 2018 at Abberly Avera as the Assistant Community Manager. Sara finds property management especially rewarding when she is able to find the perfect home for someone and can help them resolve any issues with their home. She is originally from Pennsylvania, and enjoys spending time with her husband, playing tennis, and horseback riding. Antonio Katabarwa joined HHHunt in 2018 as a Leasing Consultant at Abberly Avera. He has over five years of customer service experience in the hospitality and security industries. He portrays a strong sense of dedication to his work and looks forward to making a difference in people’s lives by providing exceptional customer service and exceeding their expectations. He is originally from Uganda, Africa and in his spare time, enjoys watching movies, spending time with family, hiking and trying out new restaurants. Juana joined our team in 2018 as a Leasing Consultant at Abberly Avera. She moved to the United States in 2008 from El Salvador and speaks English and Spanish fluently. She also has over three years’ experience as a teacher assistant. Juana is a joyful and reliable person that looks forward to providing great customer service and exceeding our residents’ expectations. In her spare time, Juana likes reading, doing art, and spending time with her family. Marlon Figueroa joined HHHunt in 2018 as a Maintenance Technician and has worked in the maintenance industry since 2016. Marlon is from El Salvador and moved to the United States in 2011. He is always ready to help others, and one of his goals is to make sure that our new residents receive an excellent customer service experience. In his spare time, Marlon enjoys spending time with his family and friends, and also enjoys going to the gym, the movies, and traveling to new places.